One thing I’ve learned since I had kids: Simplify. Lemme say it a little louder. SIMPLIFY. Honestly and truly, I wish I could go back in time five or six years and shake some sense into my past self. No, Laura, not every meal needs to be gourmet. Your kale doesn’t need to be hand-massaged. Your eggs don’t need to be freshly poached. It’s okay to buy pre-washed and cut lettuce and a rotisserie chicken. Sure, cooking at home is awesome but studies show it is one million percent okay to do things in an easier way. It took me a few years, but once I wrapped my mind around that concept, I actually kind of ran with it. Challenge officially accepted. How simple could I make things, really? 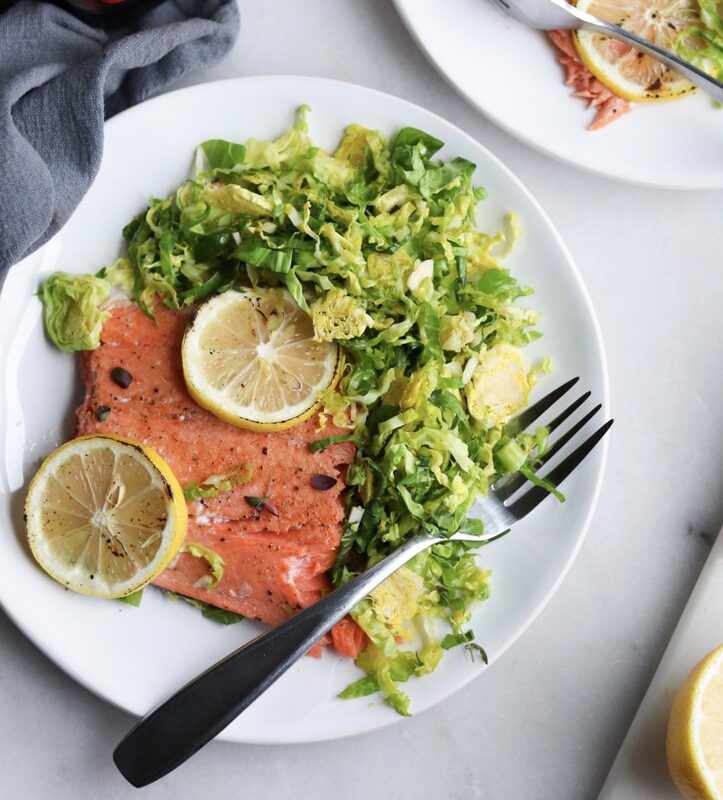 This Sheetpan Roasted Salmon with Wilted Brussels Sprouts Salad is FOUR ingredients. Six, if you count salt and pepper. It looks a lot fancier than that, doesn’t it? One of the things I love about cooking with salmon sides is how absolutely beautiful they look when you serve them. I promise you, you will definitely appear to be a seasoned cook when you serve a meal like this, just because of the way it looks! And ya know what? It’s actually cheaper to buy a side than it is to buy individual portions. It’s really easy to cook too! A few minutes under the broil first will gently sear the flesh, then bring the temperature of your oven way down to finish cooking through. The sear helps to keep the albumin at bay (that’s the white stuff that leaks out), which I should mention is totally fine to eat. It’s more of an aesthetic thing, so don’t sweat it if you see some. This is the way I cook one of my other popular recipes, too, Bruschetta Salmon – it’s my absolute favorite method to prepare a salmon side. For both, the cook time will vary depending on the thickness of your fish and the strength of your broiler, so you’ll want to stay close and keep an eye on it, but it’s easy to get the hang of once you know how strong your broiler is! Note: This recipe doesn’t roast the brussels sprouts, it lightly cooks them for just a few minutes in low heat, so they’re just beginning to turn bright green in color, lightly wilted, but still crunchy. It eats as a salad, is unbelievably simple, with so much texture and flavor.. it’s absolutely perfect! Trim the ends off of the Brussels sprouts, removing any brown or wilted leaves. Using a mandolin, food processor with shred attachment or just a sharp knife (my preferred method), shred the brussels sprouts into thin slices. Cut the lemon in half. Squeeze the juice of one half onto the shredded brussels sprouts, and cut the other half of the lemon into 6-8 very thin slices and set them aside. Drizzle 1-2 tbsp olive oil onto the brussels sprouts and toss until combined. Season lightly with salt and pepper. 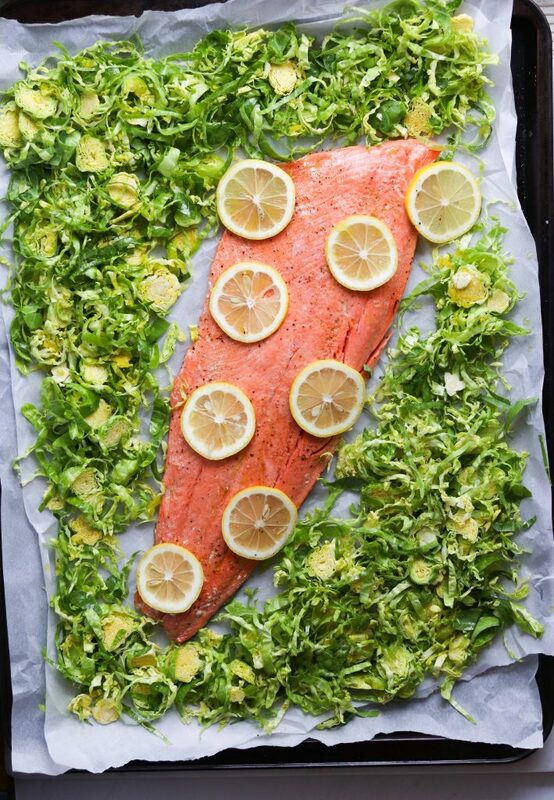 While it heats up, pat dry the salmon with paper towels and set it on a foil or parchment lined baking sheet (Note: I strongly recommend using foil.. it’s resistant to the broiler and will can be used to lift the whole salmon side off the baking sheet once it’s done cooking). Drizzle 1-2 tbsp of oil all over the salmon and season lightly with salt and pepper. 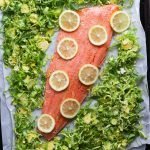 Cook the salmon under the broiler for about 2-3 minutes, then remove it from the oven and turn the temperature to 300 (your oven should come to temperature quickly since it’s already warm from the broiler). 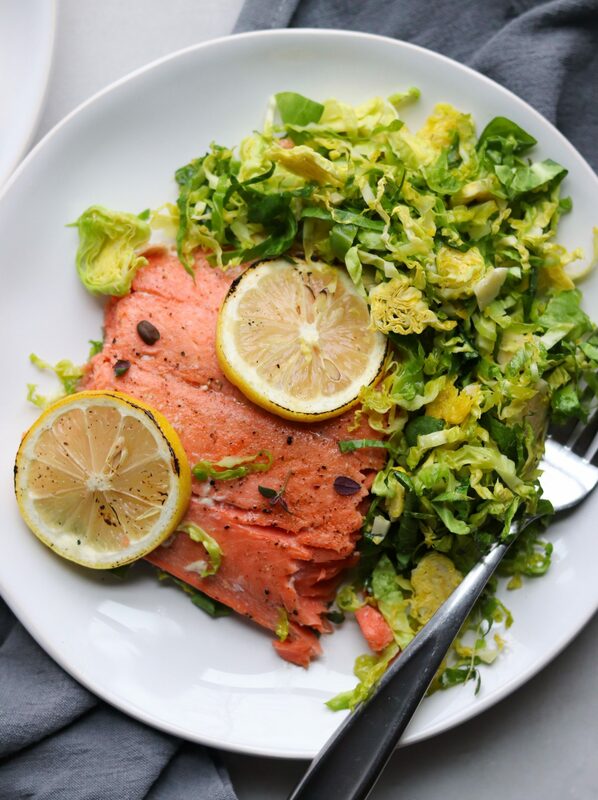 Lay the lemon slices on the fish, arrange the brussels sprouts salad around fish, then return it to the oven and cook for another 6-8 minutes or until flakey and cooked through (Note: This depends on the thickness of your fish and the power of your broiler, so watch carefully. I like my salmon medium-rare, so I err on the side of less time). Want to know why brussels sprouts always make me laugh? 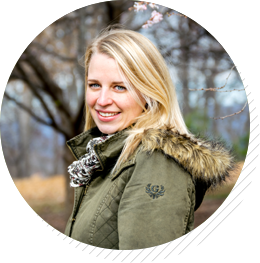 Check out my Instagram post about it, and while you’re there, I’d love if you gave my page a follow!